A few weeks ago we were in Lucerne, Switzerland. Although it was a work trip for Kevin, I was invited to tag along. Since Switzerland is a country with four official languages—German, French, Italian, and Romansch—I thought it would be difficult to get around, but many people also speak English. However, I did attempt to speak a bit of German (“Sprechen Sie Englisch?”) but not very well. 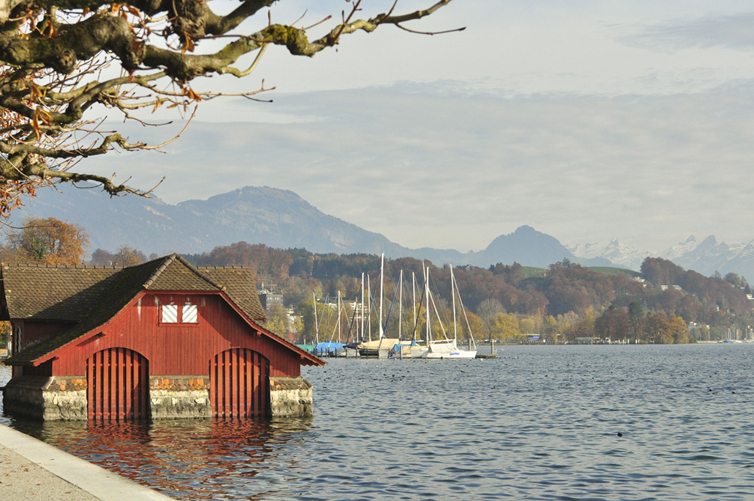 Lucerne is a charming, Swiss city (in a medieval-village kind of way). With stunning views of Mount Pilatus (Swiss Alps) and Lake Lucerne, it’s no surprise that I was not the only person carrying a large camera. There is certainly a lot to see in a small vicinity. I walked over the Chapel Bridge (Lucerne’s most famous landmark) and watched some of the largest swans I have ever seen fight for every last bit of human food that came their way. I wandered around the quaint, curvy streets of Old Town to people-watch and to browse through the myriad of retail shops setting up for the holiday season. I never ended up buying anything except the coffee that kept me warm when the sun decided to hide. There are many restaurants, pubs and cafes in the area, some overlooking the lake, so you will never go hungry or thirsty for too long. Other sights to see would be the Musegg Wall and the (Dying) Lion Monument. The Musegg Wall was part of the old rampart walls built to protect the city in the late 1300s, which look surprising well for their age. The Lion Monument honors the Swiss Guards killed during the French Revolution. It is a massive sculpture carved into the rock and mirrored above a small pond. A sad but very moving piece. If you are into art, I highly recommend visiting the Rosengart Collection. What a gem. The collection comprises numerous works from Picasso and Klee, as well as Miro, Kandinsky, Chagall, Matisse, Cezanne, Monet, and many other artists. There are also a number of photographs of Picasso and his second wife, Jacqueline. It’s an intimate museum where you can get up-close-and-personal with magnificent works of art. It’s definitely worth the 18.00 CHF admission fee. When Kevin had a bit of time off, we took the train to Engelberg and went up to the summit of Mt. Titlis via three separate cable cars with the last car being “the world’s first rotating cable car.” The views were amazing and Kevin wanted to ski, of course. Although it was terribly cold, we walked through the Titlis Glacier Cave (frozen tunnels etched out of the glacier) listening to blaring dance music and can honestly say that was a first for us. If you are looking for authentic Swiss food in a charming atmosphere, then you must go to Wirtshaus Gallicker’s. We met a fourth-generation Gallicker, a very personable man who sat down and chatted with us for a while about his college years at an American university. Kevin and I also consumed our fair share of bretzels (soft and delicious pretzels) as well as bircher müesli—after all, it was invented by a Swiss physician.